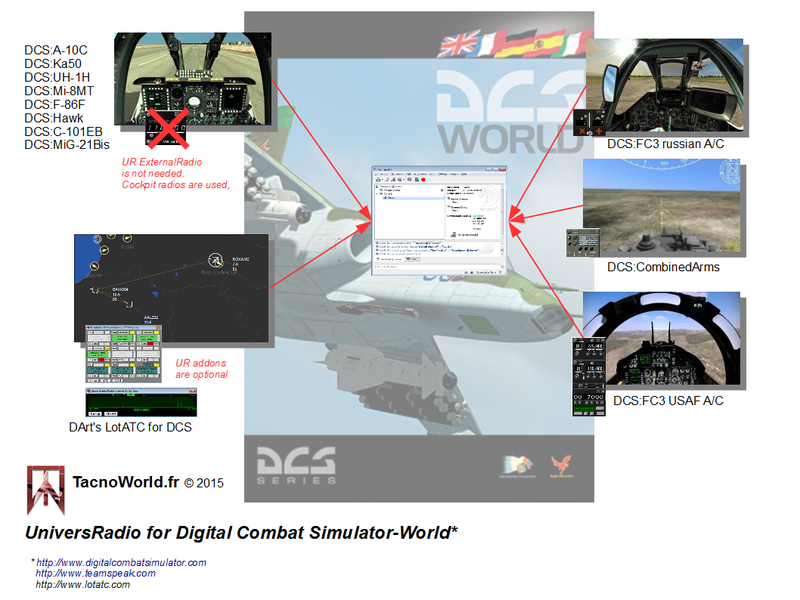 UniversRadio is a radio simulator for Digital Combat Simulator-World. UniversRadio is an add-on for DCS and based on a TeamSpeak plugin. UniversRadio brings one or severals radios for pilots, JTAC and ATC. 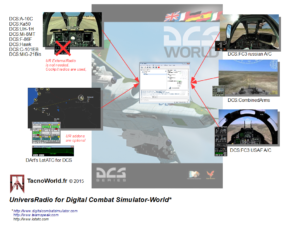 UniversRadio is a payware for assuming purchases of DCS modules and technicals needs. “Radios you have in your virtual cockpit, radios you will get with UniversRadio”. UniversRadio is a software that interacts with both TeamSpeak 3 and DCS-World (or LotATC 4 DCS), allowing users to communicate through simulated radio channels and frequencies. UniversRadio’s algorithms simulate distance and altitude effects between emitter and receiver, relief masking, frequency used, range, modulation (AM/FM), encrypting and power of radio transmitter to accurately render radio communications. Dedicated radios are available either by a pilot, an Air Traffic Controller or a Join Terminal Attack Controller. Fully clickable cockpits are integrated in UniversRadio. No 3rd application below is needed (except UR EMER when ejected). This table shows the list of aircrafts and how radios are supported by UniversRadio <here>. Less advanced cockpits and unspportted aircraft will require UniversRadio ExternalRadio. Also, if pilot is ejected, he can use UniversRadio EmergencyRadio to get a CSAR mission. 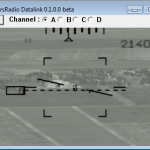 Moreover, UniversRadio Transponder can be use to diffuse your ‘squawk’ and therefore you can do an IFF interrogation on locked-on aircrafts allowing Air Police missions with other UR pilots. 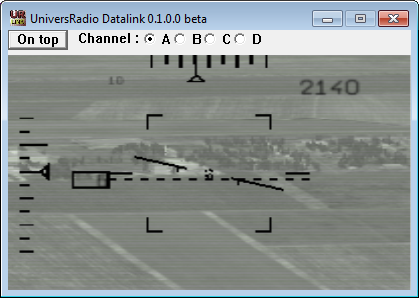 Next LotATC version will display squawks on radar scope. Currently, A-10C, C-101EB, M2000C, F-5E-3 and UH-1H IFF panels are functional. 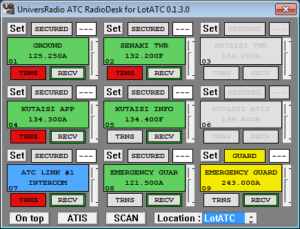 Air Traffic Controller players can use LotATC 4 DCS natively supports UniversRadio and provides up to five radios and uses UniversRadio ATC RadioDesk brings nine transmitters/receivers. A radio operator located in an AWACS can monitor radio frequencies with UniversRadio AWACS Scanner for LotATC .